The behavioural response of guppy (Poecilia reticulata) exposed to painkiller (novalgin metamizol sodium) were evaluated after electricity current. Three different painkiller concentrations were selected. In the 1st experimental group containing 4% painkiller and 2nd experimental group containing 8% painkiller fish were exposed to 12 V current for 5 seconds. In the 3rd group containing 16% painkiller fish were exposed to 12 V direct and 220 V alternative current for 5 seconds. 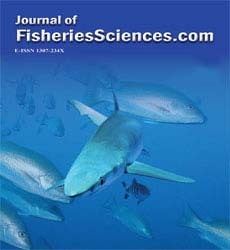 Following to the current the behavioural response of fish were recorded after 1, 15, and 30 minutes. Behavioural response refers to increase in respiration and trembling. In all groups at 1 minute after current the response were not different when compared to controls. At the high concentration of painkiller the behavioural response seemed to be decreased depending on the time.